Our Prices start at $60 for the initial TWO Hours with each additional Hour only $20 - HOWEVER...The more hours you need the cheaper it gets. 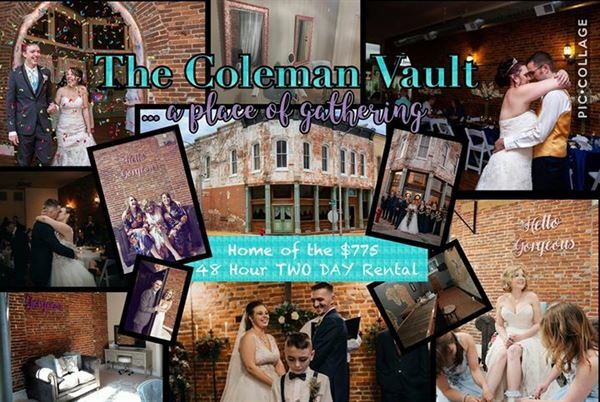 Our 24 Hour Rental gives you an Entire Day to decorate or prepare for your event...and like most, you can still add extra Hours at $20 each if needed or always upgrade to the 48 Hours. Our Most Popular Package! The 48 Hour Rental is EXACTLY That! You get 48 HOURS to prepare for your event! Our Couples LOVE this package, to come in as early as they want the day BEFORE the BIG Day and Decorate, prepare...Most even hold Rehearsal Dinner from our Commercial Kitchen followed by a decorating finale with their wedding parties so they can actually sleep in on the Big Day, then come to the Vault and have all their wedding Vendors COME TO THEM! If you don't have Vendors- NO PROBLEM we do! Just message us on our FB page, and we can send you links to anything you need whether it be a caterer, photographer or even a hair/makeup artist! We are very picky about who we recommend! Our vendors have to have good references (Typically Our past Clients). A bonus is we search for the best vendors in the business, that TRULY LOVE their job, but don't necessarily charge an arm and a leg for their services. We know how stressful planning can be and will always try to help you as much as we can :) Don't Stress..Enjoy your Day and make memories! Hate being rushed for time? Like to get everything done early at your own pace? This package is for you. 72 Hours to Decorate, Host Rehearsal Dinner, Relax, Whatever you want!